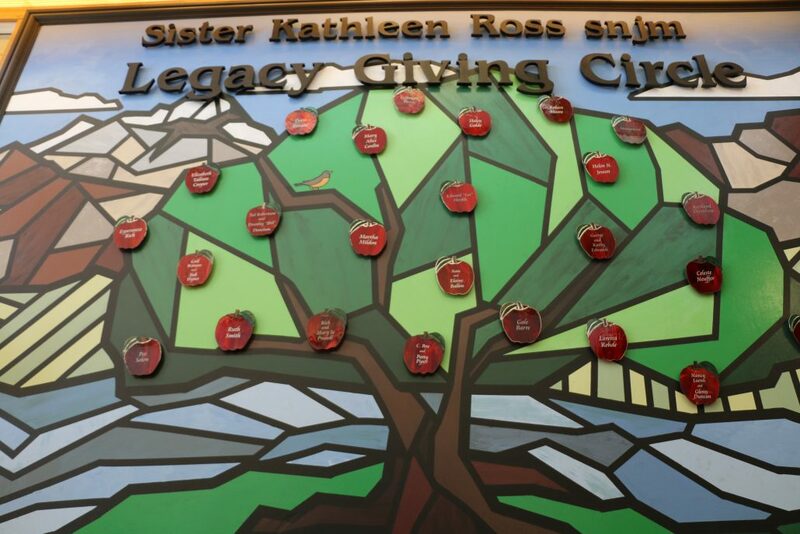 In October, Heritage University formally dedicated the Sister Kathleen Ross snmj Legacy Giving Circle mural with an event as special as the woman for whom it is named. 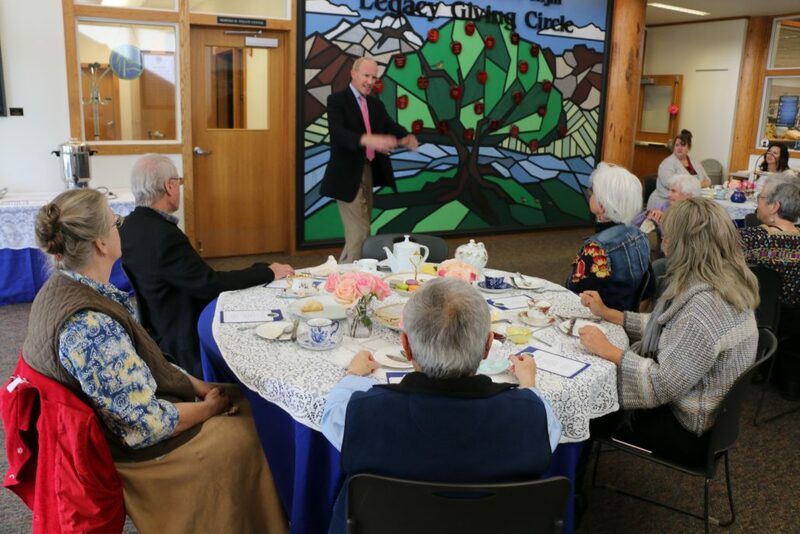 The university and its supporters celebrated those who make up the circle with an afternoon high tea. The mural design was conceptualized by Heritage visual arts major Carlos Prado, who works part-time in the university’s marketing department. 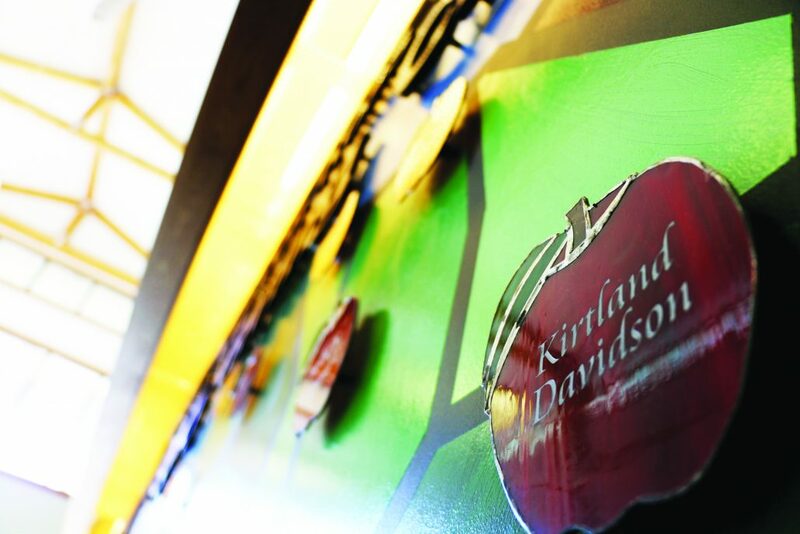 Yakima muralist and fabric artist Deborah Ann developed the final design based on Prado’s initial work, and Ellensburg glass artist Julie Prather created the stained glass apples that bear the names of the Giving Circle members. You can add your name to the Legacy Giving Circle by simply informing Heritage of your plans to include the university in your estate gift. You can bequeath a range of gifts, from stocks and bonds to IRAs, and also name and direct how your funds will be used. For more details, call (509) 865-8587. Reunion Celebrates Ten Years of M.L.S. Front: Terese Abreu (MLS program director), Ryan Inouye, Jillian Legard (’18), Veronica Hernandez (’10) with her son, Anne-Marie VanRiper, Andrew Nguyen and Sarah Gold. Back: Cesar Abreu, Robert Kinkley (’16) and guest, McKenna Smyth, Tai Pham (’08), Martha Coronel, Emily Hennings, Priscilla Fairall, Thanh Nguyen and guest. 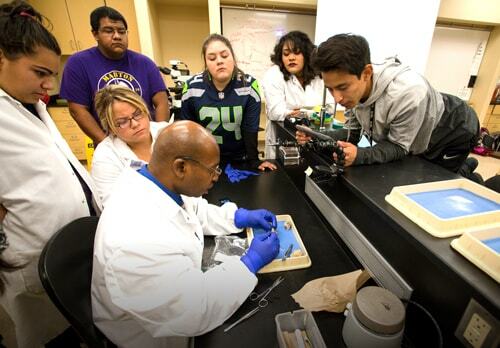 Medical Laboratory Science (MLS) alumni from throughout Washington state traveled to Wapato in September to celebrate the 10th anniversary of the MLS program. The event brought together alums and current Heritage MLS students for an evening of gourmet pizza, craft beers and camaraderie at HopTown Wood Fired Pizza. “It was a nice opportunity to offer inspiration and guidance to new students,” said alumnus Robert Kinkley. Plans for the reunion were put in motion by the students, faculty and alums in the MLS program who wanted a way to commemorate the anniversary with a bit of a homecoming. Alumni Connections facilitated the event on their behalf. http://www.heritage.edu/wp-content/uploads/2018/12/MLS-10-year-reunion.jpg 1238 2365 David Mance https://www.heritage.edu/wp-content/uploads/2018/03/Heritage-University-Logo.png David Mance2018-12-12 20:05:492018-12-12 20:05:49Reunion Celebrates Ten Years of M.L.S. and street tacos. 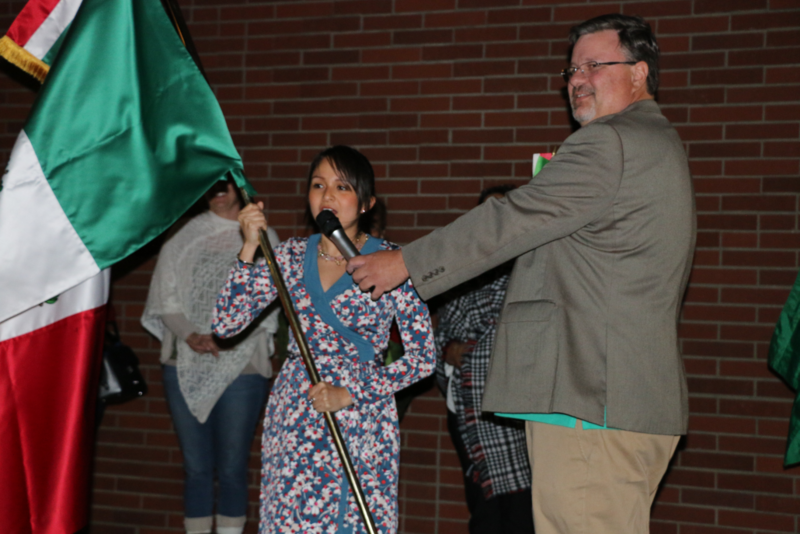 It was the university’s first celebration of El Grito de Dolores, an event of cultural significance for those with cultural ties to Mexico. El Grito de Dolores, translated to Cry of Dolores, is celebrated annually on September 15 to commemorate the start of the Mexican War of Independence. The war broke out in the early morning hours of September 16, 1810, in the town of Dolores when the Roman Catholic priest Miguel Hidalgo y Costilla organized a forced freeing of jailed revolutionaries, rang the church bell to gather his congregation and called upon them to take up arms for the cause of freedom. What followed was ten years of war against Spain, which ended in 1821 with the signing of the Declaration of Independence of the Mexican Empire. Diana Maria Oliveros Martinez from the Consulate of Mexico in Seattle called out the traditional El Grito proclamation. 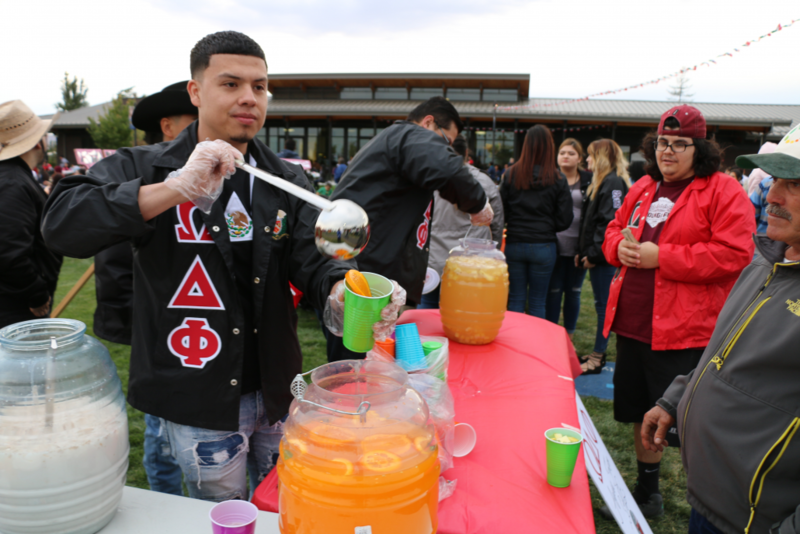 Student groups, such as the Omega Delta Phi fraternity, hosted food and activity booths during the event. 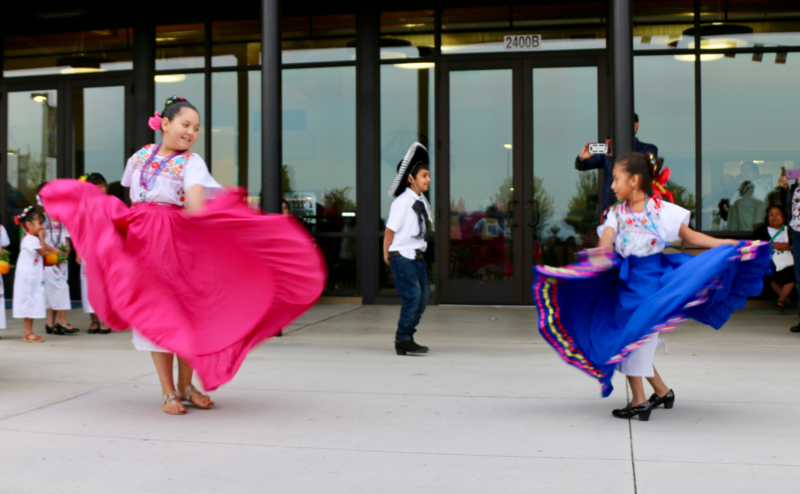 Heritage’s El Grito de Independencia celebration brought roughly 500 people to campus. 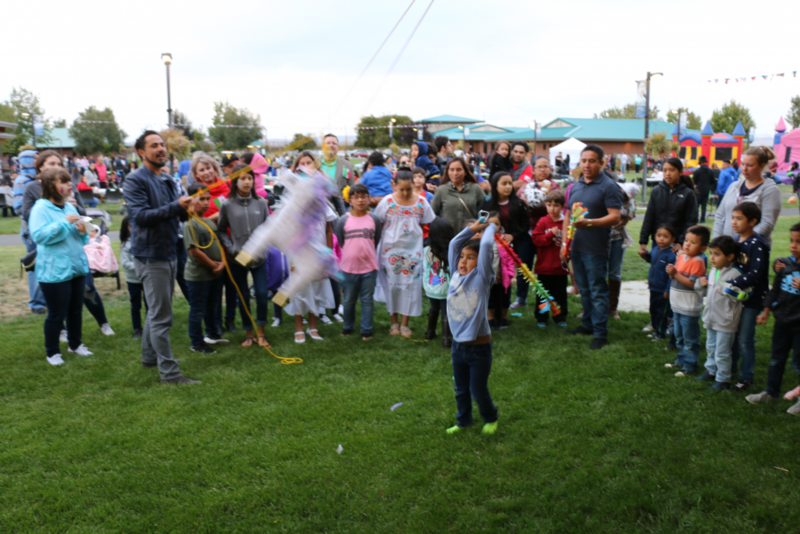 The family-friendly event featured Folklorical dancers, piñatas and games for the children, performances by the Central Washington University Mariachi Club, food vendors, and a family movie. The event culminated with the traditional delivery of the El Grito proclamation. El Grito was called out by Diana Maria Oliveros Martinez, a visiting dignitary from the Consulate of Mexico in Seattle. Video from the event can be seen on Heritage’s YouTube channel, HeritageWithinReach. Most students graduating in May spend the summer looking for their first big job. Not Sandra Benitez (B.A., Business Administration, 2018). When she graduated last spring, she walked right back into the office where she had interned as a student – now as a full-time employee. Over the last two years, ten other people have done the same thing. They’re participants in a growing Heritage University business internship program that pairs juniors and seniors with companies looking to not only offer experiential learning for students but to potentially hire them. crop and livestock products. Agriculture contributes a whopping $1.2 billion to the local economy. 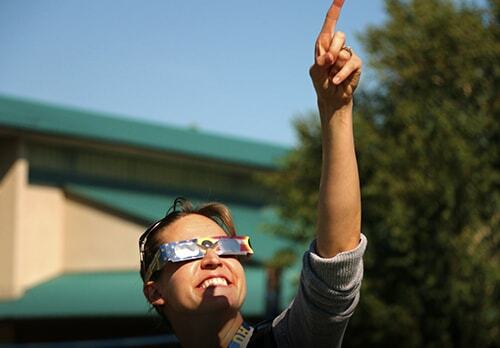 It’s a big number, and it’s growing, said Vicky Swank, business administration professor at Heritage. Swank oversees the program, placing students with majors in business administration, finance and accounting with companies that want to give them meaningful working world experience. A job after graduation isn’t guaranteed but, often job offers are extended. Since the summer of 2017, almost half – 10 out of 22 students – were hired by the employer where they interned. “From Stadelman Fruits to Yakima Chief Hops to Roy Farms, our students are doing meaningful internships and getting hired,” said Swank. She said Heritage has recognized a perfect fit between its students and area agriculture companies. For some, such as Heritage junior Alfonso Gonzalez-Colin, the opportunity to enter their careers starts long before graduation. He started what was to be a summer work experience with Stadelman Fruit last June. By the end of the summer, the internship turned into a part- time position in the company’s accounting department. By the time Gonzalez-Colin graduates, he will have two years of professional experience with a company that he loves, and in the career he is studying to enter. Swank considers a significant part of her job to be that of preparing Heritage students for the internships many will pursue. Every business class at Heritage requires students to do at least one oral presentation. It’s those “soft skills,” said Swank that, along with rigorous course requirements, make students better communicators, positioning them for success in an internship and beyond. A Heritage advisory board consisting of area business leaders makes recommendations that keep Heritage’s curriculum strong. Its members weigh in on experiences that can make Heritage students stand out from the crowd. John Reeves, an agriculture industry expert and Heritage board member, sees ag industry internships as key in that student experience – and key in making Heritage students most useful in the ag industry. “There will be 10 billion people on the planet by the year 2050,” said Reeves. “That means developing more and better ways to feed more and more people. For an area that is a true mecca of agriculture, that’s a big opportunity. “We create a better-equipped graduate by always asking how we can better prepare them,” said Swank. “What else can we do to develop a student who is a strong communicator, is collaborative and works with others, and a critical thinker who approaches a problem and comes up with a solution? Mike Goettl, CEO at Yakima Chief Hops, first heard of Heritage’s professional internship program while on a campus tour. 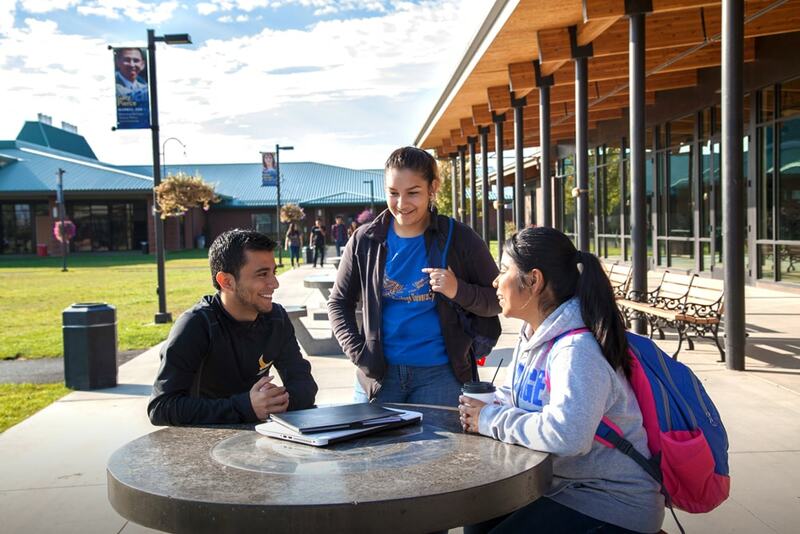 Garcia works with several educational institutions – Yakima Valley College, Central Washington University and Perry Tech among them. She says Heritage students have a particularly strong work ethic, an eagerness to learn, and a huge desire and determination to do well at their jobs. 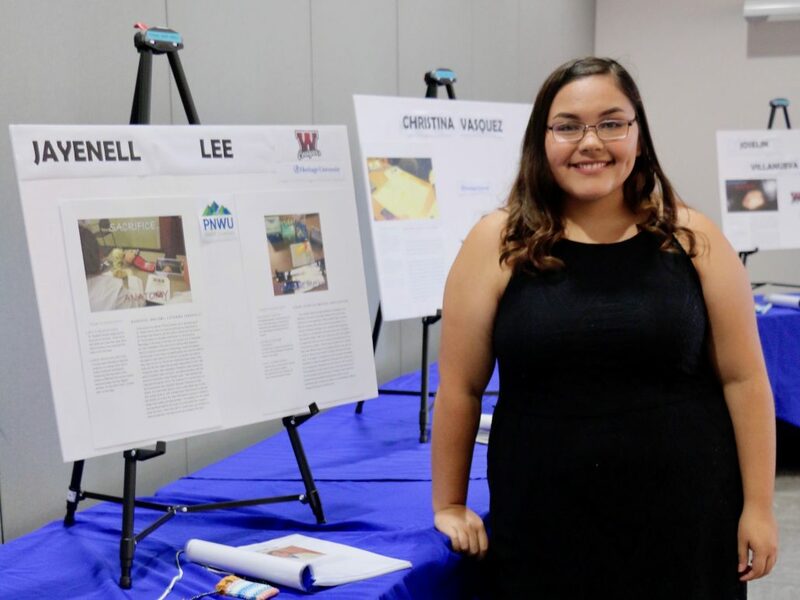 Like most Heritage student interns, Denisse Gutierrez, Business Administration ’18, went into her internship with experience in the agriculture industry. Her dad owns a small orchard, so she was used to helping pick apples. As an intern at Roy Farms, Gutierrez helped with safety audits, drug and alcohol testing and data input. As the months went on, she had the opportunity to get a sense of the bigger picture at the company. 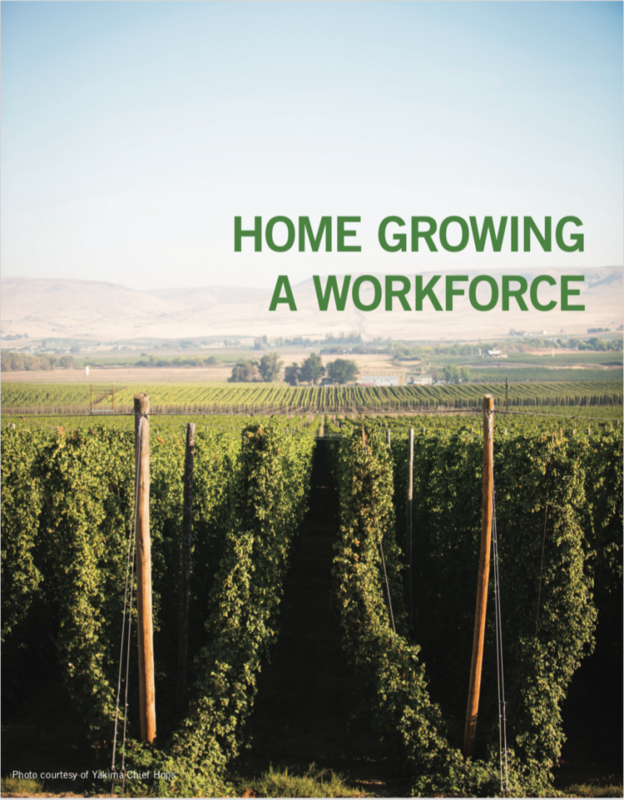 Gutierrez did a second internship at Yakima Chief Hops where she was ultimately hired – and considers both huge personal growth experiences she wouldn’t have had in the classroom. “In my first internship, initially I kind of kept to myself. But you interact with a lot of different people in the working world. As I kept talking to more and more people in the office and the warehouse and the fields, I just kind of opened up. Your communication skills really develop. “I had an amazing experience during my internship,” said Sandra Benitez, who feels Swank’s placement of her with Roy Farms matched her with the perfect company. 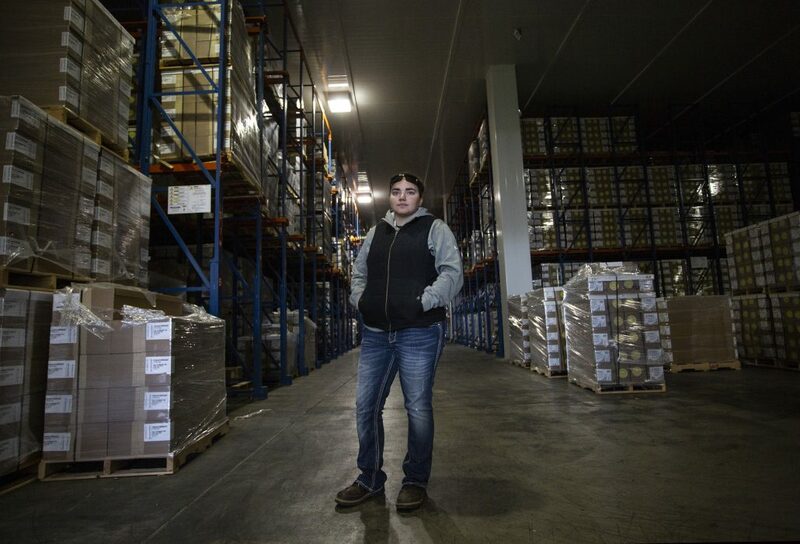 Sandra Benitez’s internship at Roy Farms led to a position in the company’s human resources department. Reeves sees big things for Heritage interns. lots of private equity coming into Washington State and a big bunch of that into Yakima, we’re looking at everything from robots to super high tech irrigation to drones, with big companies and lots of investment. To learn how your company can partner with Heritage University’s business administration internship program, contact Vicky Swank at swank_v@heritage.edu, or call (509) 865-0726. Each November, Heritage University celebrates Native American Heritage Month by recognizing four Yakama tribal elders for their lifetime contributions to their community. This year’s honorees include a businessman; an artist and child welfare advocate; an ordained minister; and a former police officer, cultural preservationist and spiritual leader. Delano Saluskin has a deep and abiding commitment to building the health and vitality of the Yakama Nation’s resources and its members. His foundation to serve Yakama Nation began through the encouragement of his grandfather, Alex Saluskin, who inspired his grandchildren to obtain a college education. Much of his life has been dedicated to helping the tribe develop its economic sovereignty. During his 15 year tenure as the Tribal Director, Saluskin, helped to build several of the Nation’s most prosperous industries including Legends Casino, Yakamart and Yakama Forest Products, which provides much-needed jobs for tribal members and funding for programs and services. He joined Tribal Council in 2012 and continues his service today. Along with his commitment to the economic success of the Yakama Nation, Saluskin is passionate about the physical and spiritual wellness of his people. He is a strong advocate for mental health programs that provide holistic wrap-around services that encourage our young people to turn to traditional teaching instead of gangs, drugs and alcohol. 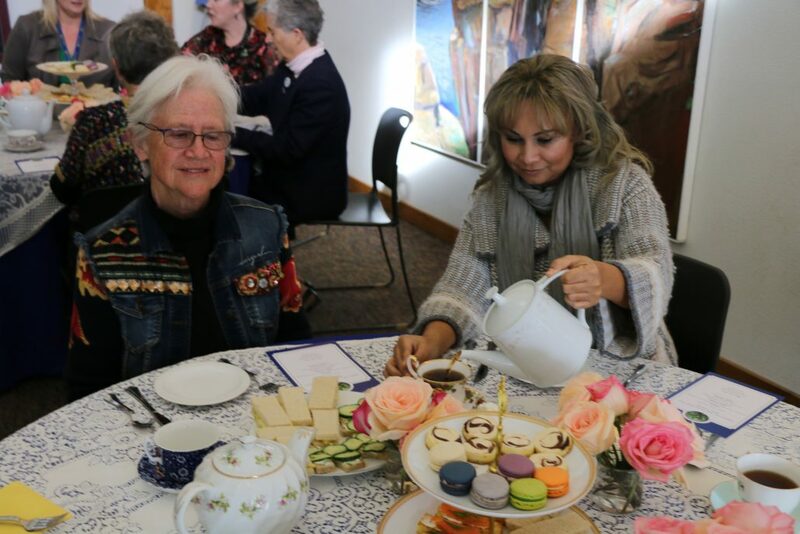 Wanda Sampson is a licensed and ordained minister who leads the Yakama Valley Fellowship, which was first started by her late husband decades ago. She spent 43 years in social services helping people at their time of greatest need before retiring eight years ago to devote her time to the ministry. In addition to the monthly spiritual revivals that she leads, Sampson is a dedicated volunteer with Noah’s Ark Homeless Shelter in Wapato, Washington. 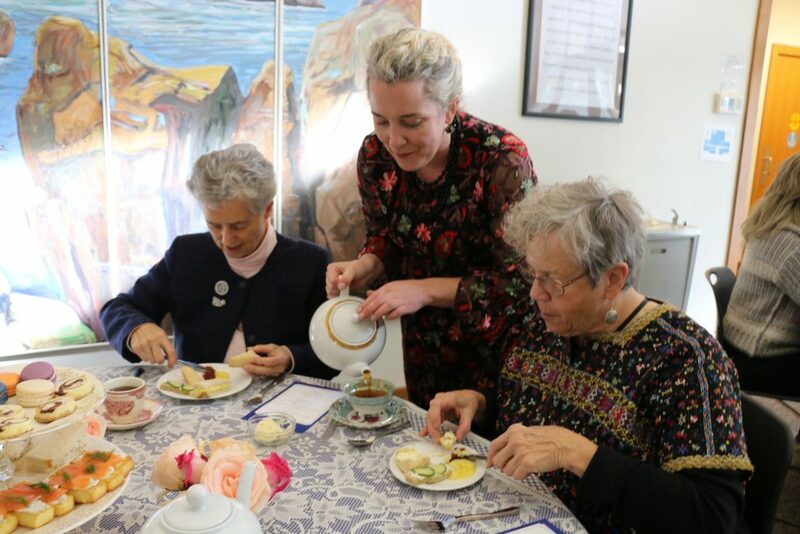 She and her friends provide monthly potluck meals to the people who rely on their services and gather and fill backpacks with hats, gloves and necessities to distribute to those in need each winter. Lonnie Selam, Sr. is a protector of people, a preserver of the culture, and a spiritual leader. Raised by his grandparents, he grew up learning the traditional ways, speaking the language and moving around as they followed the seasons and the foods. 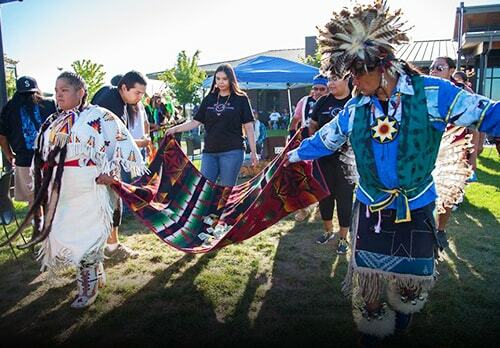 These early learnings instilled in him a deep connection with his culture and commitment to help the Yakama people. He spent ten years as an officer with Yakama Tribal Police before being appointed by Tribal Council to preserve the Yakama cultural heritage through the Nation’s Cultural Resource Program. He spent 18 years working to build the prosperity of the Yakama Nation and to protect its sovereign treaty rights as a member of Tribal Council. Even now he continues his service as a spiritual leader with the Toppenish Long House. Marlene Spencer Simla is a talented artist and a tireless advocate for children. She attended the Institute of American Indian Arts in Santa Fe before transferring to Ft. Lewis College in Colorado to earn her bachelor’s degree and later earned a master’s degree from Heritage College. Throughout her lifetime, Spencer Simla has helped hundreds of children and young adults build a foundation for life-long learning and to find safe and loving homes. She spent 17 years as a center director with early childhood education, and 22 years working with children and family welfare services. Spencer Simla’s paintings have graced numerous publications and have been shown at the Yakama Nation Cultural Museum, the Central Washington State Fair, and the Washington State History Museum in Tacoma. She is a storyteller who rewrites and illustrates Native American legends. 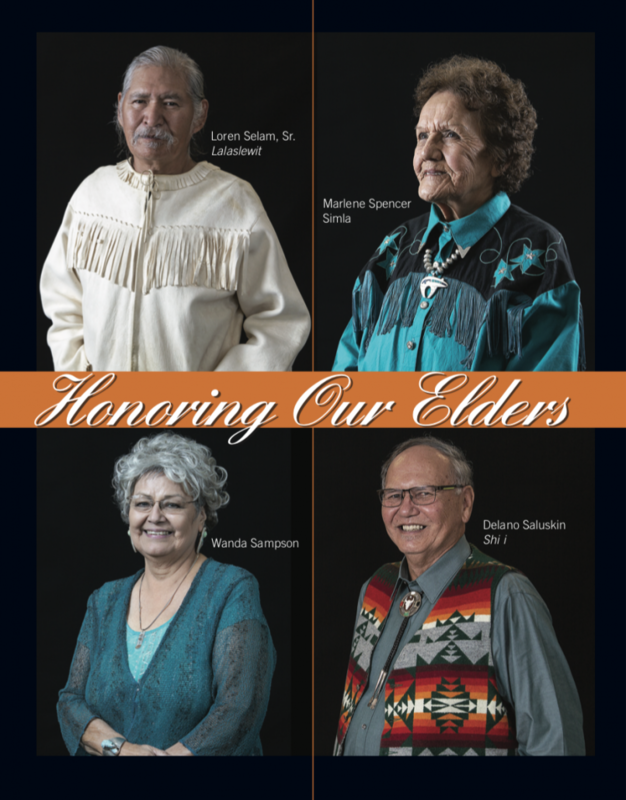 The four elders were recognized during a ceremony at Heritage that kicked off the university’s month-long celebration. A series of ads that feature their stories and images ran in the Yakama Nation Review and the Yakima Herald during the month. Dr. Julie Randolph-Habecker from PNWU talks Trino Savala and Kanani Heemsah, both students at Yakama Nation Tribal School, through the extraction of DNA from strawberries. White Swan High School eleventh grader Joselin Villanueva wants to be an obstetrician. Her friend and classmate Christina Vasquez wants to be a cardiothoracic surgeon. Both girls are bright, articulate and passionate about their education and career goal. Still, the deck is stacked against them. Statistically, they are among the population that is most at risk for low academic attainment. They come from one of the most economically disadvantaged communities in the state of Washington, are persons of color, and neither girls’ parents have a college degree. However, behind these young women is a team of educators determined to give them every opportunity to break away from statistics to find their own personal success. 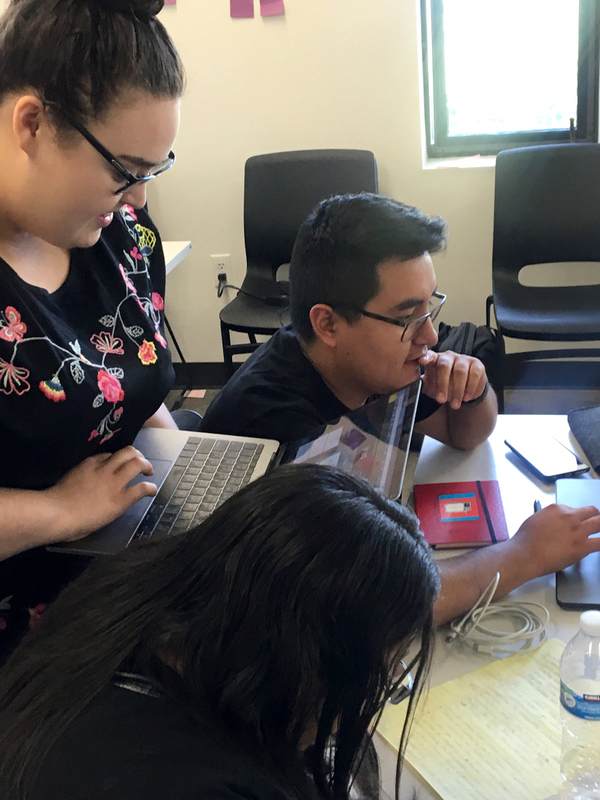 Villanueva and Vasquez were two of ten students who participated in the Heritage University and Pacific Northwest University of Health Sciences’s (PNWU) joint Summer Program for Yakama Students (SPYS) research experience. The youth spent 40 hours a week for five weeks immersed in science and culture at the two universities. 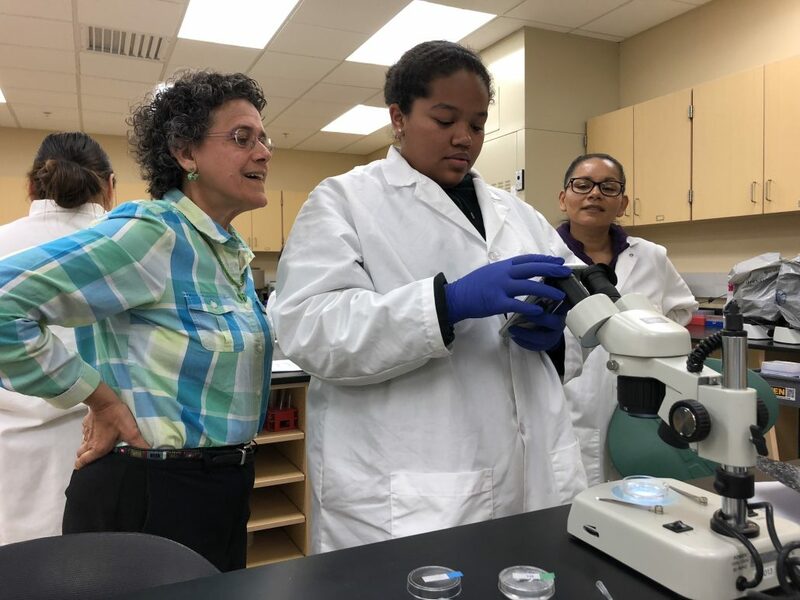 Dr. Mirna Ramos-Diaz (left) and Heritage student mentor Mireya Cruz (right) look on as Yakama Nation Tribal School student Isela Cuevas works with the microscope in the university’s lab. Their experience started at Heritage where they were introduced to biology and chemistry. They spent time in the laboratory examining single-celled organisms through the microscope and learning how to use pipets. After a week at Heritage, they spent the next two weeks at PNWU learning about the scientific method and how to design, execute and present an experiment. They studied cells and mitosis, isolated salmon DNA, and were introduced to viral and bacterial illnesses. During their second week at the medical school, they delved into the human brain and central nervous system. They dissected sheep brains and cows eyes to get a better understanding of the nervous system and reviewed case studies on Alzheimer’s disease and autism. Peppered into their studies were lectures and conversations from Native American medical and environmental scientists from throughout the nation who shared with them a bit about their journeys. That, said Villanueva and Vasquez, was one of the most powerful parts of the experience. Western science immersion was only part of the story. Native American and Latino values and tradition, such as seasonality, sacrifice and trust, were woven into lessons throughout the experience. Students’ SPYS experience was capped off with the presentation of their research and journals. Pictured here is Jayenell Lee, a student at White Swan High School. Students would reflect daily on their lessons and how those relate to their own culture. Tribal elders were present at each session to share their stories with the students. 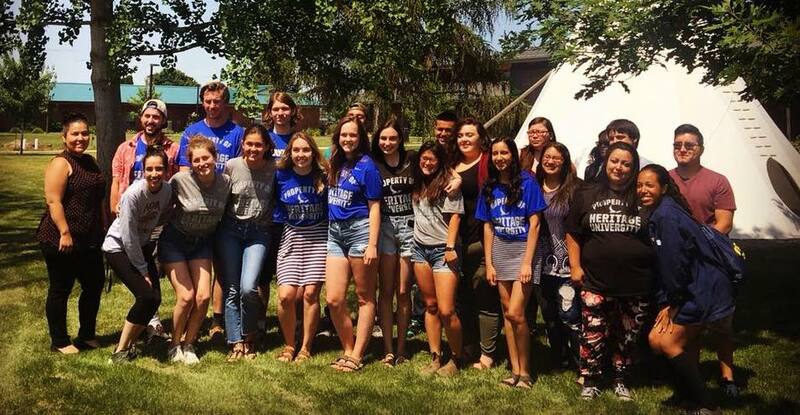 During their final week of labs, they worked with Ciarra Greene, a Nez Perce tribal member who is an expert in traditional ecological knowledge. 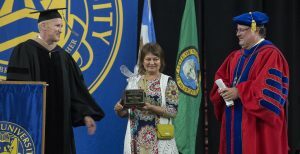 “As a Native educator, the value of integrating traditional knowledge as a basis for redirecting how we teach our youth throughout the SPYS program held and holds great merit for educational attainment,” said Maxine Janis, Heritage University associate professor, president’s liaison for Native American affairs, and co-coordinator of SPYS. 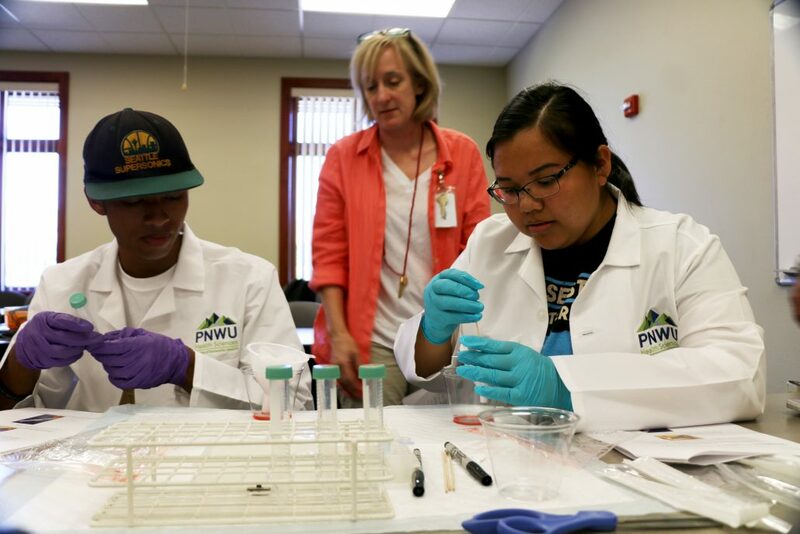 The summer science experience was part of a larger, on-going partnership between Heritage and PNWU to build the pipeline of Native American and Hispanic students studying the health sciences and moving into medical careers. Currently, only 6% of all medical school students in the United States are Latino(a). That percentage drops to a mere 0.3% for Native Americans students. This lack of representation negatively impacts health care, said Ramos-Diaz, especially in rural communities like the Yakima Valley where there are higher numbers of Native and Hispanic people. The two universities started working together two years ago through an after-school program called Roots to Wings, which was founded by PNWU in 2013. Like SPYS, participating students are exposed to college and the health sciences through mentorship and hands-on learning. Roots to Wings is open to kids from the sixth through 12 grade who go to school in the Harrah or Mt. Adams School Districts or the Yakama Nation Tribal School. Up until this year, Roots to Wings students between the ages of 16 and 18 were able to travel to Washington D.C. to participate in a 10-week, paid Native American Summer Research Internship at the National Institute of Health (NIH). However, when the NIH changed their policy to participants had to be 18 or over unless they were accompanied by a parent or guardian for the duration of the experience, several Roots to Wings students who had been accepted were unable to go. 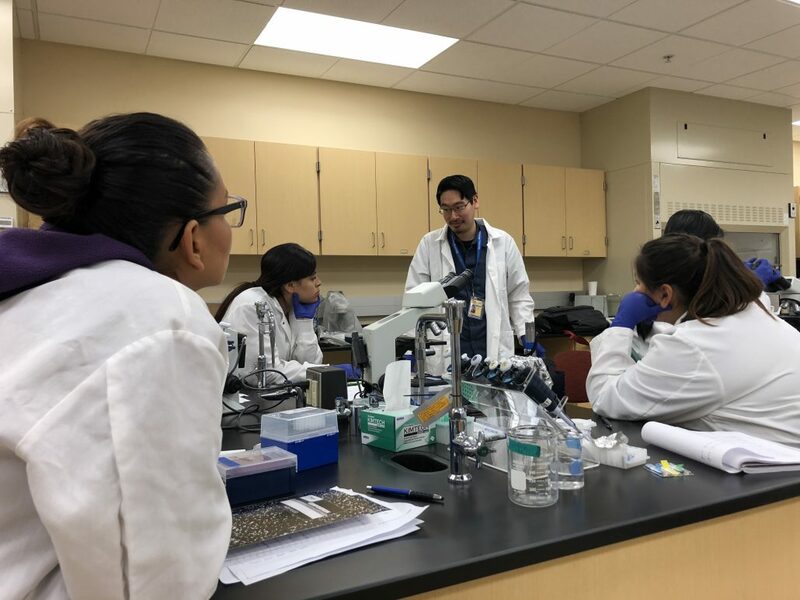 Heritage Assistant Professor in Biology Dr. Bob Kao led students through an introduction to the tools of the lab during their first week of SPYS. That’s when the idea for SPYS came to be. Ramos- Diaz, Janis, and local Native American physician Dr. Naomi Lee had been talking for some time about ways to partner on outreach for Native youth in the lower Yakima Valley. When word came down that the Roots to Wings kids who were underage wouldn’t be able to travel to DC, the women started talking about what they could do to mirror the summer program locally. Lee had already designed a chemistry curriculum in anticipation of the partnership, which Ramos-Diaz used as a platform to build the SPYS curriculum. Funding the program was the next hurdle. Ramos-Diaz reached out to Dr. Rita Devine at NIH to see if funding could be made available to support the summer experience. The summer camp was a brand new concept for the NIH. They were intrigued and agreed to fund the experience. In a matter of a few weeks, SPYS was born. 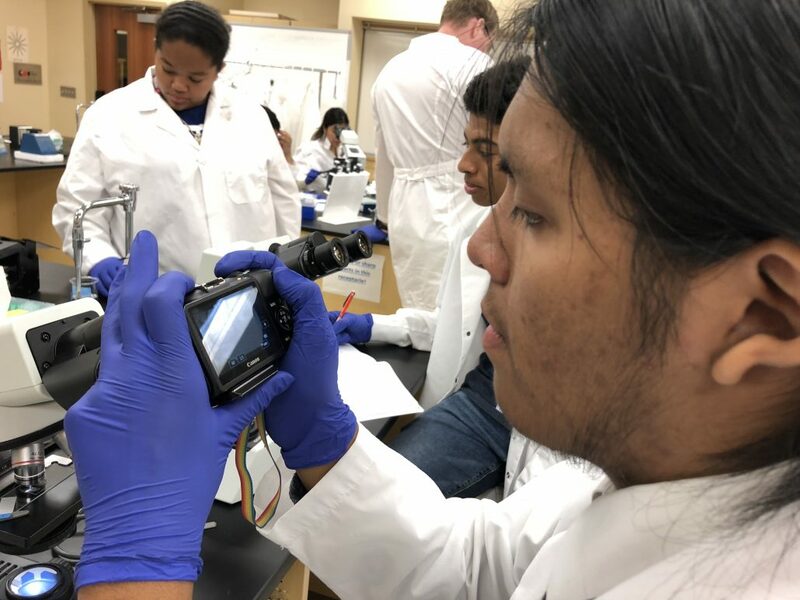 Yakama Nation Tribal School students Eric Pebeashy, Trino Savala and Isela Cuevas record images and data of the organisms they are viewing through the microscopes. And that, said Janis, is what it is all about, helping kids become stronger academics, to expose them to a world without limits, and to help them build the resiliency that will take them from high school to Heritage to PNWU and into the community where they will impact the health and well-being for us all. Rural America. It’s not just country music and acres upon acres of farmlands. It’s a complex stewpot of people from different cultures and ethnicities. It’s multi-million dollar agribusinesses that communities depend upon for their economic prosperity. And, sadly, it’s communities that struggle to deal with the same social ills that impact larger cities–poverty, crime, violence, substance abuse–but often without the resources necessary to make a difference. A joint project between Heritage University, Whitman College and Seattle-based PopUPJustice gave students a voice to tell the story of rural America through their eyes. Called Rural American Digital Lab (RADlab) students became filmmakers, producing short documentaries on topics of social justice that impact their communities. life in rural America. The goal said Aurora Martin, the founder of PopUPJustice, was not just to introduce students to the conferencing from the Whitman power of digital technology and storytelling to affect societal change, but also to build bridges and community across two very diverse student bodies. For Heritage students, RADLab was an opportunity for many to tell their own stories because they or their family members were the subjects in videos that dealt with compelling topics including domestic violence, gender issues, homelessness and immigration status. 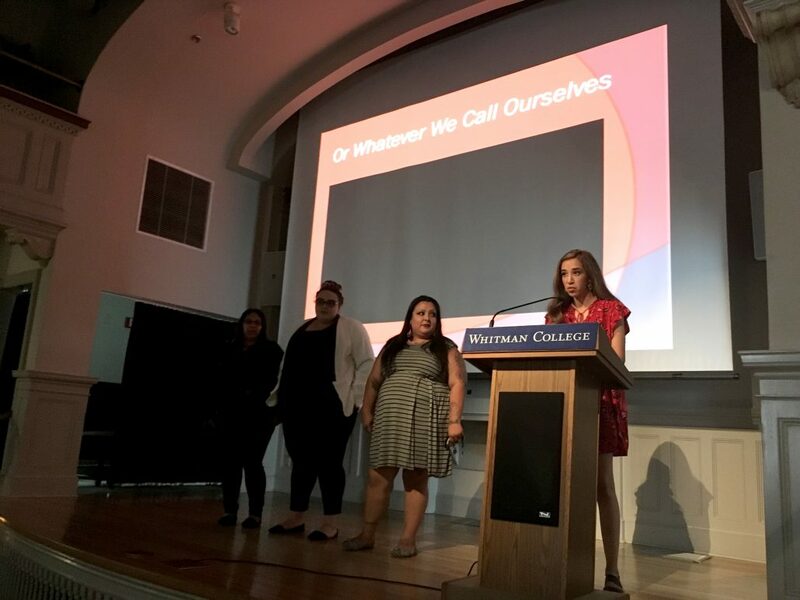 (Pictured left to right) Heritage students Cecilia Vizcaino, Noemi Sanchez, Madeline Alviso Ramirez and Maria Soto present their project at Whitman College. The structure of RADLab was intense–19 days packed with training on advanced digital equipment and audio and video editing software. Every morning, Heritage students, whether in person or through video conferencing from the Whitman campus, heard lectures from subject matter experts about rural issues, ethics in storytelling, podcasting and video log best practices, and more. Every afternoon, the students were let loose to brainstorm, conduct interviews with their subjects or shoot supplemental footage, and edit their project. The students were broken into groups, and Soto’s group created a project based on the poem, I am Joaquin by Rodolfo Gonzalez. It explores the complexity of Mexican-American identity. Her group filmed the stories of four individuals, and two group members were featured in those stories, which dealt with the challenges of gender identity, undocumented students, farm workers, and a cholo who is giving back to the community. 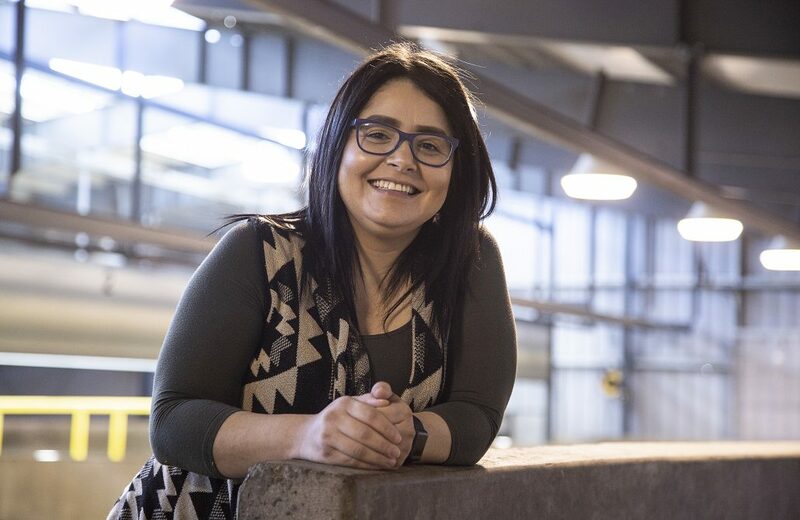 Noemi Sanchez is a junior history major who participated in RADLab and also appeared in the video, sharing her experiences as a queer and non- binary student in a conservative rural area. Noemi Sanchez and visual arts major Anthony Tzib start their initial research for their RADLab project. Thompson said RADLab allowed these students to bring attention to their stories while also gaining job skills and showcasing what they could do when given the resources in a hands-on, experiential learning setting. Martin, whose organization helps to consult and incubate innovation and social connections, saw RADLab’s mission to be two-fold. “At the end of the day, RADLab was a community-building experiment that sought to plant seeds of innovation starting with the stories of why.” Explaining further, Martin said that because they worked with a shoestring budget that required innovative thinking just to launch the program, they were forced to strip away many extraneous factors and focus on those who could best inform solutions – end users who actually live the problem and who benefit from solutions. 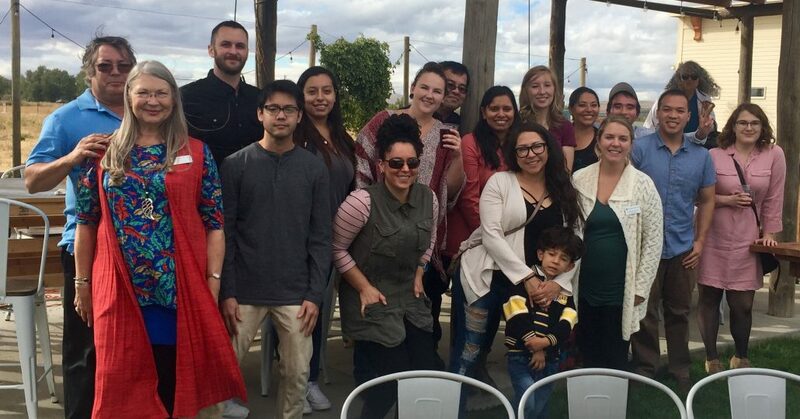 Bridging the diverse cultures between the Heritage University and Whitman College students was a key element of RADLab. Blake Slonecker, chair of Humanities at Heritage and a member of the RADLab design team, said one of his goals for his students in any learning experience is that they leave asking different questions than when they started. For one Whitman student, that meant overcoming a fear of the homeless and being willing to see them as a people with a story of their own. 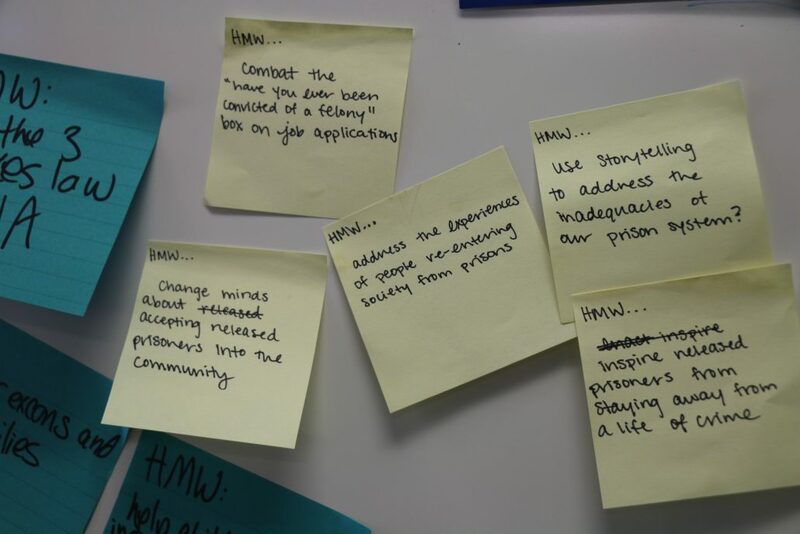 For Heritage students, it was transforming the way they saw the power of digital technology to produce words and images that told a story in ways that can impact hearts and minds for change. 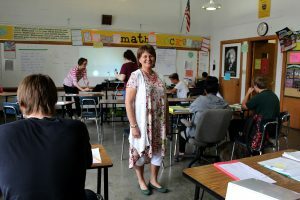 Colleen Sheahan in the math class at West Chestnut Academy school in Yakima, Wash.
As Colleen Sheahan moves through the math classroom at West Chestnut Academy (WCA), students bent over their geometry work call out to her. “PC, PC,” they say. “Come look at this.” PC, short for Pastor Colleen, is their affectionate nickname for the founder and head of this private Christian school that serves children from preschool through 12th grade. Sheahan stops, looks over the geometric shapes being formed by Popsicle sticks, gives a few words of encouragement before moving on. She knows each of these kids by name, their families, and their stories behind what brought them to WCA. By her own admission, Sheahan wasn’t looking to become a teacher, let alone start and run a school when she enrolled in a pilot bachelor’s degree program offered in partnership between Heritage, Central Washington University, and what was then Yakima Valley Community College. 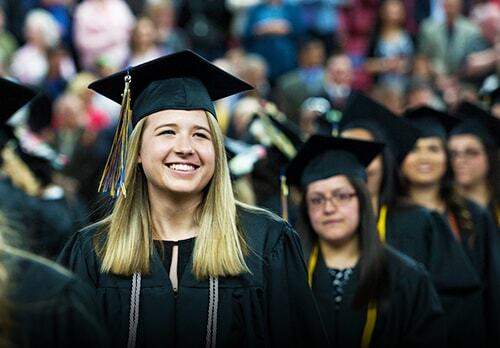 It was simply the most convenient way for her to earn a degree—any degree— without leaving home. She was a licensed pastor ministering to children through Westpark United Methodist Church in Yakima, and she figured it could help her in her work there. Two years of classes and long nights studying, Sheahan graduated, still without any intention of teaching. She went back to her life ministering to children. Then, a year later, something happened. Sheahan went to sleep. “I had the most intense dream that I had started a new school. When I woke up, it stuck with me. Then things around me kept pointing me back towards the idea of this school, that we had to do this,” she said. That was in the spring. Six months later, the non-profit West Chestnut Academy was born. It opened in 2001 with just 12 students and was housed within the Methodist church. The next year, enrollment grew to 60. Ever since then, it has averaged 80 students annually. Last year the school moved from the church into a larger facility left vacant when St. Paul’s Cathedral School moved from the location they had been housed in since 1914.
can provide individualized attention to students, that celebrates and meets the needs of the whole child,” she said. In many ways, the mission and vision of West Chestnut Academy mirror that of Heritage University. It is open to all with the desire to learn and embraces diversity—be that ethnic, socioeconomic, or in learning styles. Tuition is kept as low as possible so that children from all income levels can attend. But, she points out, bare bones does not mean lower quality. The school is licensed by the State of Washington. Students participate in art, music, and physical education along with the staples of math, English and science. They flourish in the smaller classes—particularly those who struggled in public schools where they are one in a crowd of hundreds. This June, the academy will send its 59th graduate out into the world. Alumni of this school have gone on to colleges and universities, trade schools and into the workforce. Sheahan beams like any proud parent when talking about her grads. “It’s a lot of work to care about kids. Here we provide a sanctuary for children where they can feel comfortable and are able to learn,” she said. 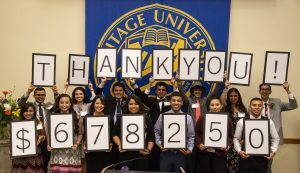 The Bounty of the Valley Scholarship Dinner, the premier annual event in the Yakima Valley dedicated to raising scholarship funds for Heritage University students, brought in $678,250 in early June. This year marked the 32nd anniversary of the event that celebrates the many talented men and women who are transforming their lives and our communities through higher education. Heritage University students served as hosts for the 250 guests in attendance, welcoming them as they arrived on campus, sharing their Heritage experiences, and expressing their gratitude for their ongoing investment in the university. Heritage mathematics major Brandon Berk, who served as the student speaker during the event, represented the many students like him who excel because of the scholarships they receive. “I had thought of going to college but didn’t think I’d ever have the opportunity to attend because of money,” he told the audience. Virginia Hislop, an organizer of the very first Bounty of the Valley event 32 years ago and who has attended every year since, was overjoyed by the turnout and generosity of longtime donors, new supporters and guests. Since its inception, more than $5.7 million has been raised at the event, with every dollar going directly to student scholarships.